When it comes to solving baby’s sleep issues, one of the main pieces of advice you’re given is to ensure they have a strict bedtime schedule. This is said to help get them into a routine, eventually making it easier to get them to sleep and more importantly, prevent them from waking up too frequently. However, can baby’s sleep schedule ever be too strict? Here we’ll look at just how rigid your little one’s sleep schedule should be. The Bedtime Routine – How Strict Should It Be? This should be done at the same time every night. However, that being said, you may find it really difficult to follow the same time schedule every single night. Things happen and sometimes you may need to be a little more lenient with the timings. Generally speaking, the routine is more important than the timing. It basically teaches your little one about sleep cues. They’ll quickly start to associate bath time as a build up to sleep. Once they’re placed into the crib, they’ll know they’re now expected to sleep. Well, at least that’s how it should go, but all parents know this doesn’t always work! Even the best sleep schedules don’t always stop baby resisting sleep sometimes! So, your baby’s sleep schedule should be strict, but not too strict that it can’t be altered as and when it may be needed. One thing many parents have discovered the hard way, is that a sleep schedule which is too strict can be incredibly stressful. The same applies to parent-led routines, whether it be for feeding or sleeping – they are very difficult to consistently follow. Flexibility with baby’s sleep schedule can really reduce stress and gives you a small amount of wiggle room in case anything crops up. For example, you could end up having to visit family, or an emergency could present itself. Or, you simply may want to stay up later one evening and get up later. The key to ensuring a little flexibility doesn’t mess up baby’s sleep schedule is to wait until your little one is used to the routine before it changes. So, start off strict just until your baby becomes familiar with the sleep cues and they manage to sleep most of the night. Then, you can occasionally start to throw in changes to the routine when they’re needed. Just be careful not to change the schedule too often as this will really confuse baby and make it difficult to get them back into a routine. My Family And Friends Often Comment On My Schedule – Am I Wrong? Ah, there’s that well-meaning advice again! While they do mean well and they genuinely are trying to help, the only person who can decide upon baby’s sleep schedule is you. The thing is, your little one’s schedule should be determined by your own personal circumstances. So, say you want to put baby down to sleep at 8pm, but your family are telling you that’s far too late. Are they right? Not necessarily, because your schedule and their schedule could be completely different. For example, you may get up later and therefore go to bed later than they do. In this instance, putting baby down to at 6pm and waking up at 5am (if you’re lucky), simply wouldn’t work. So, you need to organize baby’s routine based upon your own schedule, not somebody else’s. There’s also the fact that each child is different. So, some babies will wake up earlier than others, while some will become sleepy quicker than others. The routine that you create for them will therefore depend just as much on your baby’s natural needs, as your own. An earlier schedule may work for a lot of parents, but that doesn’t mean it will work for you. The best thing you can do is smile and agree, or say you appreciate the advice, but your current schedule is working out really well for you. Advice is something all parents are given a lot of, often from complete strangers! Just remember they do mean well, but you absolutely don’t need to follow it. Overall, to start with, baby’s sleep schedule should be strict as this is the only way they will learn what is expected of them. However, you shouldn’t be afraid to mix it up a little as and when you need to. There is no right way to do it, you’re the parents so it’s up to you how you do things. Got your own useful tips on creating a baby sleep schedule? Or maybe you’ve experienced unwanted advice or criticism regarding your own routine? Let us know below! There is one mother I know who had three kids in succession. She could attend to no other chores around the house during the day but to take care of these little ones. She would keep them awake during the day – robbing a wink for herself here and there – so that they slept in the night and that was the time she did her housework. To each their own as they say. Yes, different techniques for everyone – “To each his own” as they say. As mentioned in the article, there is no one else to better determine a baby’s schedule but the parents because they are the ones who interact with the baby on a daily basis. Parents should also remember to be flexible because a baby’s sleep pattern changes as he/she grows up. I am sharing my experience here. I have a four months old baby. When the baby is born he will be sleeping 22 hours. He will wake up when he is hungry or has soiled the diapers. By the time the baby is one month old, his sleeping hours will be reduced to 20 hours. When the baby is two months, three months old, four months old, his sleeping hours will substantially be reduced. In the first month, the baby will wake up in every two hours. As he grows older, his sleeping hours will increase. 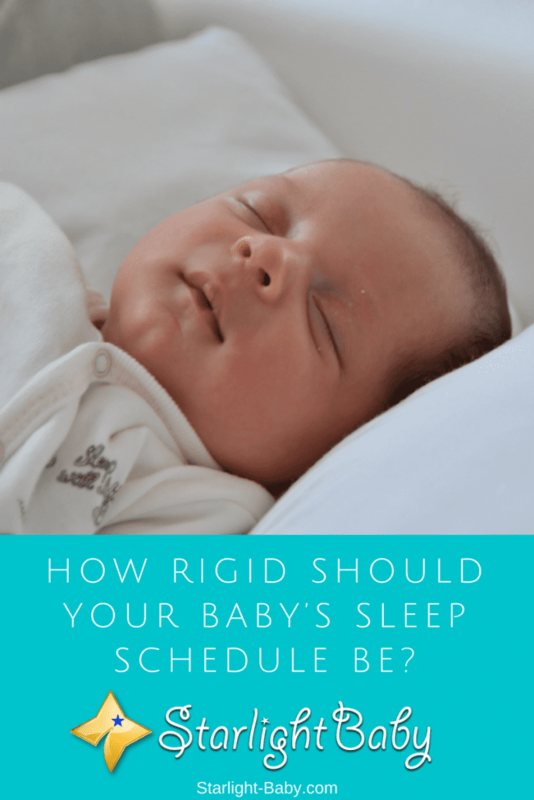 I don’t think having a rigid sleeping is very helpful to your baby because he cannot follow your orders. Thank you for this additional information, vinaya. And yes, you’re right – a rigid sleeping pattern will not benefit the baby because of the changes in his/her sleep hours and sleeping patterns – as a newborn, it sleeps a lot during the day, and awake at night. But as the baby grows, he/she learns to adapt to night time sleeping. My baby is almost one year now. All through these months, I have understood that the baby does not know he is sleepy. It is you who has to make him understand that it is sleeping time. When the baby feels sleepy, he usually does not go to sleep, he will go restless, starts crying, beings to sctatch his head. You will have to see these signs. Being too strict in a baby’s sleep schedule is definitely stressful to any parent that makes uses of such routine. This is definitely going to make it absolutely difficult for that parent to improvise in situations of emergencies. Babies will always be babies, being too strict is only going to be at a disadvantage to the parent, babies can easily be manipulated into sleeping anytime you wish. All you need to do is bath and feed them, make the surrounding of the room conducive to encourage sleep and the baby will dose off with ease. True, Heatman. It could become a stressful matter to both parents and baby. A parent could actually put a baby to sleep anytime with a little rocking and a lullaby. It’s not so difficult to put them to sleep when they’re still in their first few months. It’s different when a baby is already able to crawl but that could be helpful at times, too. One can keep the baby going on its “four legs” and once he/she becomes tired, he/she would go to sleep without a fight. I actually discovered that my little one has this habit of napping off almost immediately after bathing. So, what I normally do is get the food ready and have the baby fed almost immediately after bath and sleep is the next thing to do. You did the right thing. Good job! As I always say, parents know their babies better so we are able to anticipate our babies’ routine. It’s just getting familiar with it. That way, we are able to work around their sleeping habits or schedules. In my opinion, I would say that it’s not encouraging to be too strict with a baby’s sleeping routine. It is to the benefits of the parents to always find the best way to put their child to sleep without feeling too reeled in the task of doing so. With just a nice warm bath and enough feeding, dressed in a comfortable clothe and in a mild environment (not too cold nor too warm), the baby would easily be put to sleep. I agree with you. Parents should not be too strict with a baby’s sleeping pattern because his/her sleeping habit changes as he/she grows up. Flexibility is the key. Babies would usually feel sleepy after bath time, add to this the environment. It would surely condition the baby to sleep.